Ex journalist Allan Linton makes a precarious living running a detective agency in Dundee with his enigmatic sidekick Nidderie. His stock in trade is errant husbands and lost cats; so when he's hired to find a missing girl it looks like just another routine job. Then the discovery of a dead body in London links the case to something far more sinister. Tina Lamont disappeared for a very good reason; someone wanted her dead. 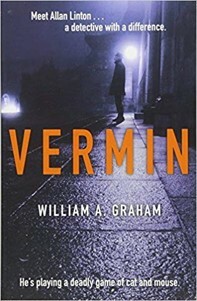 Good British private eye novels are few and far between, making this debut from William A. Graham even more enjoyable. He gets the tone just right without trying too hard. Linton is a suitably down at heel, almost, hero without being a cliché and he has a back story that could be interestingly fleshed out in future books. The supporting cast is strong too, with secrets of their own - that demand elaboration. It might not, as Linton says, be New York or LA, or even Glasgow come to that; but the streets of Dundee can be mean enough on their day. Graham brilliantly evokes the tensions of a city on the sharp edge of economic change holding onto past glories in the face of new fears. This is a confident debut that takes on triumphantly the challenge presented by a much-copied sub-genre. Allan Linton and his associates deserve to have more journeys down the drizzly streets of Dundee.